The AFC North was very tight last season with the race coming down to the Final Week of the season, the Bengals beat out the Ravens for the North, while the Steelers are always in the race & the Browns are in rebuilding mode. 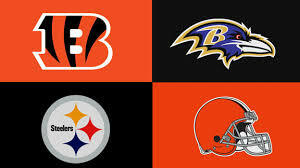 The AFC North was very tight last season with the race coming down to the Final Week of the season, the Bengals beat out the Ravens for the North, while the Steelers is always in the race & the Browns in rebuilding mode, but could be fun to watch. 2014 will be no different in the AFC North as I debated who would win the division throughout the off season. Lets take a look. The Bengals have been in the postseason 3 straight seasons, with 3 one & done outings. The Cats will go as far as QB Andy Dalton can take them, the cuts of RB BenJarvus Green-Ellis & Safety Danieal Manning was surprising, but not a shock, as this will be RB Giovani Bernard backfield. The Bengals will have to show this season not just they can win the AFC North, but take the next step in being the best in the AFC, they might can, but we will see. 2013: 8-8, tied for second place in the AFC North. Head coach: John Harbaugh, seventh year. Last year was the first year the Ravens did not qualify for the playoffs under Harbaugh. Key departures: Michael Oher is gone, having signed for $5 million a year in Tennessee and opening up a spot at right tackle. Safety James Ihedigbo was a 16-game starter and finished tied for second on the team with three interceptions. Cornerback Corey Graham was usually the third cornerback but saw plenty of snaps; ditto defensive end Arthur Jones, who’s gone to the Indianapolis Colts after a 4-sack season in 2013. Ed Dickson and Terrance Cody are also gone after disappointing tenures, but a year after losing long-time leaders Ray Lewis and Ed Reed, the Ravens return almost intact and need to get more out of what’s on hand rather than create a new identity. Key arrivals: Five-time Pro Bowl wide receiver Steve Smith is the headliner of a small but solid free agent group that also includes offensive lineman Jeremy Zuttah and tight end Owen Daniels. The Ravens re-signed tight end Dennis Pitta, a favorite of quarterback Joe Flacco, after he missed almost all of last season and Smith, Pitta and Daniels should have a chance to produce under new offensive coordinator Gary Kubiak. First-round pick C.J. Mosley should be an immediate starter at middle linebacker, while second-rounder Timmy Jernigan and third-rounder Terrence Brooks should compete for playing time at defensive tackle and safety, respectively. The Ravens main problem last season was there O-Line, this season with Gary Kubiak & his West Coast Offense I think could do wonders for Joe Flacco to get the ball out his hands quicker & with Steve Smith form a pair like he had with Derrick Mason earlier in his career, the Ravens defense is still good, but not great mainly in the secondary where I think they can be weak at this season. The Ravens will be in the hunt for the AFC North title once again, but can they be better than 8-8 this season. The Steelers are at a crossroads right now, either to rebuild or to try to get one more push to win. I do think the Steelers have gotten younger in some areas, but 2 keys will be as they are in Steel town, can Big Ben stay healthy & can Troy Polamalu lead the Steelers secondary. I think Ben will be better, but the Steelers secondary could be a problem. The Steelers will be in the race, but maybe will come up just a little short. The Browns found out last week that Josh Gordon will be suspended for the entire 2014 season, QB Brian Hoyer & Rookie QB Johnny Manziel both looked bad during the pre-season, Hoyer wins the job going into the game vs. the Steelers. The Browns tho will be a tough out, but not enough to challenge for the AFC North crown this season, but there defense will keep them in games. Next Preview will come for the NFC North, which could see a lot of fire power this season.